The second installment of ‘Lucy’s Make-up’ is my eyes – the mascara, eyeliner and eyebrows, minus the eyeshadows! Firstly, my holy grail palette, the Urban Decay Naked Basics. I use this for my brows every day, both brown shades are ideal for my brows. Naked 2 is great for a more subtle brow, while Faint is perfect for a stronger look. The Maybelline Gel Eyeliner is a great little product although you need a lot of practice to get the cat eye right. The product is jet black and very easy to work with. Soap and Glory Archery Brow Pencil consists of two ends, a pencil end and a liquid end. The idea is you use the liquid end to draw and outline and the pencil end to fill in, however I only use the pencil end. This is the ideal shade for me and I used it all the time before I got my Naked Basics Palette! 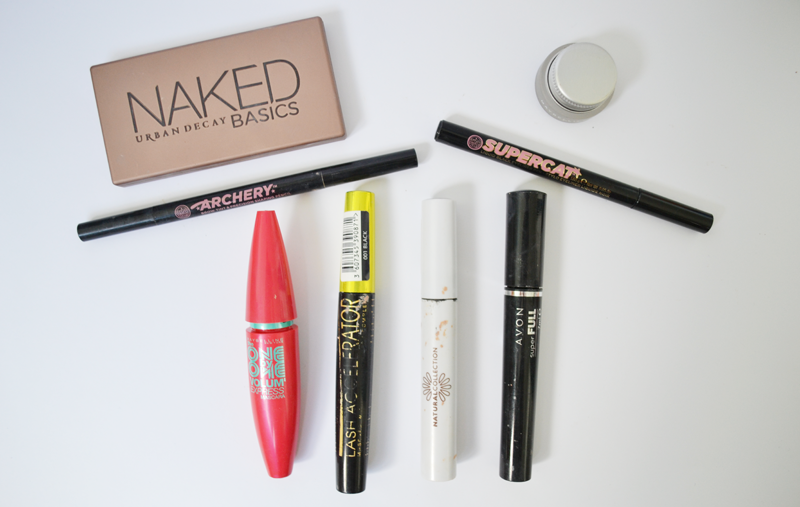 Soap and Glory Supercat Eyeliner is my favourite product for eyeliner. It’s fairly easy to use, a jet black colour and stays put all day. I love the Maybelline One by One Volume Express mascara, it gives amazing volume and length but I hate how it transfers onto my brow bone throughout the day. I think the Rimmel Lash Accelerator is my favourite mascara right now, easy to work with, it gives ther perfect amount of length and volume and is easy to build up with too. I bought the Natural Collection mascara because it was waterproof. It is a lovely mascara although not as waterproof as it claims. This is the perfect budget product. Finally, the Avon Super Full mascara was a big love of mine for a long time, it gives amazing length to your lashes and I’m just waiting to repurchase it soon! Next Friday I’ll bring you my bronzers and blushers! What are your favourite mascaras/eyeliners/brow products?